Discovery Bay, known as Tai Pak Wan in the past, was developed into a successful low density residential areas by Hong Kong Resort Company Limited. Like Lantau Island in the past, ferries was the only means of external transport while buses were as shuttle service between different residential areas within Discovery Bay. All these services mentioned above are provided by Discovery Bay Transit Services Limited (DBTSL). The bus fleet of DBTSL mainly composed of Japanese product including Isuzu, Mitsubishi, Toyota and Nissan Diesel. As the increase of the residents brought by the development of Discovery Bay, DBSTL not only introduced more vessels with higher capacity, but also placed order for high capacity full-sized single decker for the shuttle service. In 1994, DBTSL acquired their first European bus model, Mercedes Benz O405. The first two were arrived with the original front and rear grille and completed their bodyworks by Asia Auto locally. This pair of O405 commissioned in mid. of 1995 and further two O405s with Hispano Carrocera bodyworks of Spain were introduced in 1996 and 1998 respectively. In 1997, a Dennis Dart 9.2m bodied by Plaxton was introduced for using on the Shoppers' Bus service. The era of low floor bus in Discovery Bay also started with Dennis Dart, two Dennis Dart with Plaxton Pointer bodyworks joined after a short while of the commissioned of the first Dennis Dart. These two Dart SLF are resembled to the sample operated by City Bus unless they were fitted with single door Pointer bodyworks. The first Dennis Dart in Discovery Bay is unique in Hong Kong as it is the only 9.2m step entrance sample with dual-doorways bodywork. Further delivery of Dennis Dart SLF was made in 1999 with a pair of Plaxton Pointer 2 bodyworks samples entered service in 1999 for the use of Shoppers' Bus. Instead of the O405, there are another Mercedes Benz product found in DBTSL, two O814 minibuses with Plaxton Beaver 2 bodyworks joined in 1998 for internal service. However, when there was the need for minibuses, the order went to Japanese and no more European minibuses purchased until now. The opening of the Discovery Bay Tunnel in 2000 resulted in a much convenience of external transport. DB01R linked with the Town Centre of Tung Chung and DB02R to and from the airport were launched and a fleet of MAN buses were purchased for these services. DB01R served with MAN NL262 with their single door bodyworks completed by MAN in Germany while DB02R served by two MAN 13.220 with local China Kong bodyworks. This was the start of a good relationships among MAN and DBTSL. DBTSL tended to MAN when acquired new buses with only minibuses was an exception. There is a diversity of MAN in the fleet including MAN 14.220 with Berkhof bodywork, the successor of NL262, NL263 with Portugal Caetano bodyworks, 12.220 bodied by Goppel. In addition, MAN 13.220 and 18.310 with Berkhof bodyworks serving the members of the Discovery Bay Golf Club and the DB02R. The networks of DBTSL was further expanded in 2005 after the opening of Sunny Bay MTR Station. A new route DB03R was introduced and widely welcomed by the residents as it is much convenient to interchange MTR Tung Chung Line at Sunny Bay. To cope with the demand, DBTSL first purchased five MAN NL262 from City Bus. On the other hand, MAN together with Gemilang in Malaysia, successfully in providing new buses to DBTSL for catering the demand and replaced the aging bus in the fleet. The most noticeable should be the A84 made by Lions Bus which chassis made in China. Though two Yutongs from China acquired by the Discovery Bay Marina Club, MAN still is the mainstream of the fleet. 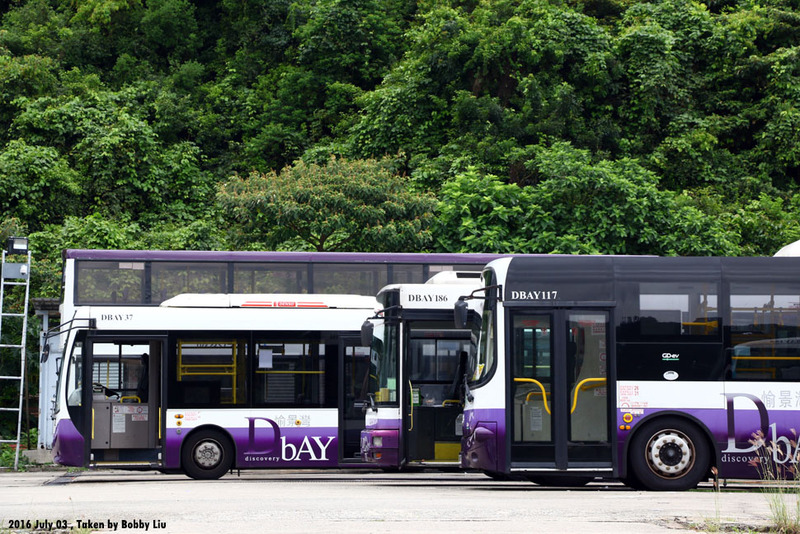 As buses entered service in 90s started to withdraw and more residents bring by the development of Discovery Bay, DBTSL evaluated a Alexander Dennis Enviro500 in early 2011 for testing the use of double-decker within Discovery Bay. Finally, DBTSL ordered a batch of 6 Volvo B9TL double deckers with Wright Eclipse Gemini 2 bodywork in 2014 and entered service in Aug ., 2015. To go one step further, benefited from the Pilot Green Transport Fund offered by Environmental Protection Department, a pair of GDEV electric bus was delivered to the community and started to serve the residents in the end of Dec., 2014.